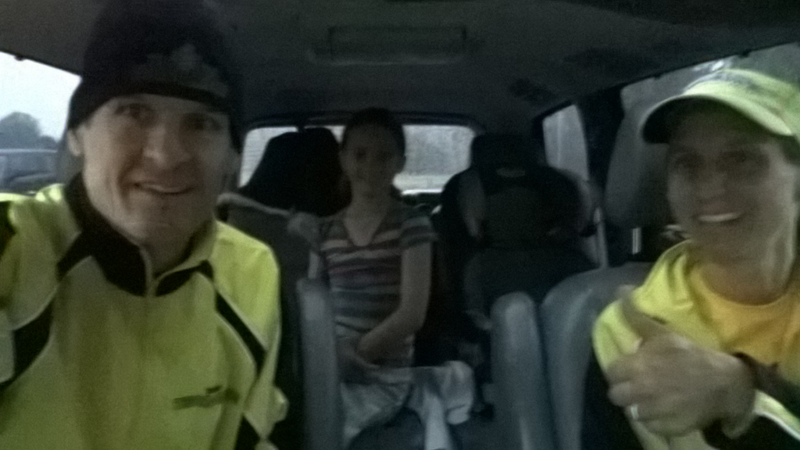 It's pouring rain and the Soares family is headed to nearby Ancil Hoffman Park in Carmichael, Ca. After watching McFarland, the great movie about H.S. Cross-Country running, and then Anna during her XC season, we were inspired and signed up for this XC race. XC racing is usually about 5 km across open fields (a park) and through winding trails (single-track & fire-roads). It's different from trail running because it's a sprint. Racers typically wear racing flats with or without spikes. It's different from city 5k races in that the start is very wide, giving everyone the same chance to dash to the front for the best position when the course narrows. And the coolest part of XC racing is the team scoring. Your team's top 5 finishers achieve placing points and combine for an overall score. Then you continue at different parks & campuses in the region for season standings. However, we weren't able to get an FCA team registered, so Robin, Anna and I entered the "Community" race held before the actual XC race. Ariel is watching us from the Medical Tent where she is "helping" write names on the list. It's wet and the trails are getting muddy and we realize these conditions, although appealing to the Pacific Athletic racers, is a detractor to the Community runners. There's only 7 racers! And that include the 3 of us. I help rip off Anna's rain jacket. The lead mtn bike is ready on the open field. Go! A young man bolts out front and I wonder if the mtn biker will keep ahead of him. Robin is closer behind me and Anna is running alongside! This is too cool! I'm running side-by-side with my daughter in the same race. It's one of those special moments, like 4 weeks ago when she asked if she could wake up early and go running with me before school. A dream come true. A blessing from the Lord. But then reality hits.. I've got to tell her to slow down. "Anna, slow down and pace yourself or you won't make the 4 miles". "4 miles! You didn't tell me it was 4 miles." This gets a laugh out of the few others that are running near us. "Well, almost 4 miles… longer than the usual 5k". She's a great sport and adjusts her pace. I pull ahead, keeping an eye on the young man and the lead bike ahead circling the large field. The turns around the trees are slippery! I try to run as tactical as possible, watching my footing but staying close to the tangents as possible. I still slip a couple times but nothing pulls. Through the start area again I wave to Ariel and love seeing her big smile. Now we head out onto the slippery trails. Mile 1: 6:19. Splashing through the puddles I feel the cold water chill my feet. My body is feeling good and enjoying the hard effort. My breathing is good. Around the field I saw that the leader wasn't gaining ground on me. And now I'm clearly catching up. I've got to give it it my all, it's rare to be racing in 2nd place with a chance to win! At 1-1/2 miles I feel my shoes getting lose and say a quick prayer that God will keep them tied. Before 2mi, I make a move. I’m right behind him and my shoe comes untied. As I prepare to make a quick shoe-tying-pitstop I realize 1) I should have double-tied my shoes and 2) I really think God has an even better plan. I stop and tie my shoe. I feel psyched up, excited to see how this plays out. I start running again faster than before. Mile 2: 6:31. I catch him and pass. But he locks on. We've been running along the American River and now turn in, rounding a beautiful park and golf course area. The lead bike stops and points to continue on the trail. Amidst my hard breathing, trying to stay composed so 2nd place doesn't sense weakness, I see a steep short hill covered in slick mud. I gather strength and shorten stride. I don't want to slip and fall and have him go by with new confidence. Whew! I make it with only a little slip. Up and down and around slippery corners, it's going great! Right when my lungs and legs are ready to give up, we cross the road, one more little hill, and then, ah, I see the finish field coming in to view! Mile 3: 6:36. Onto the grass I can no longer hear his footsteps behind me. I don't know if he's catching up or falling back. I run as smooth as possible. Around the trees, even more slippery, I'm glad to make the final turn and head for home. I listen to the loud course monitor shouting instructions and I can tell I have about 3 seconds on the young man. Thank you, Lord, what an exciting fun race. I look to God and cross the finish line glad to end the quick pace. 23:30 (6:26 pace). This is better than I expected. Surprising. Ariel joins me and we run back to look for Anna and Robin running together. Ariel tells me about hearing on the walkie-talkie of a runner that fell and we wonder who. We see Anna and Robin doing great and cheer for them and then hurry back to the finish to bring them in. Even with a few racers it was a fun family experience of Cross-Country running! Then we watched the teams line up, about 80 women for the first race, fast shoes and many wearing spikes. Very fast! Next time we'll race with the teams, and be sure to be humbled.